Nissan's internal probe accuses Ghosn of hiding some 9 billion yen ($79.9 million) in deferred compensation. TOKYO – Tokyo prosecutors have indicted ousted Nissan boss Carlos Ghosn, close aide Greg Kelly and Nissan for allegedly misstating Ghosn’s compensation in the company’s financial filings over several years. Both men were also re-arrested in a move that extends their prolonged jailing in Japan. Nissan, as a corporate entity, was also indicted for its alleged role in filing securities reports that understated Ghosn’s compensation. Nissan confirmed its own indictment as well those against Ghosn and Kelly in a statement, apologizing for the situation and promising to improve corporate compliance. Tokyo prosecutors have indicted ousted Nissan boss Carlos Ghosn, close aide Greg Kelly and Nissan Motor Co. for allegedly misstating Ghosn’s compensation by tens of millions of dollars in the company’s financial filings over the span of five years, Japanese media reported. The moves came three weeks after prosecutors arrested Ghosn and Kelly in a surprise sweep that cast a shadow over the future of the Renault-Nissan-Mitsubishi alliance that Ghosn has pieced together over two decades into the world’s biggest auto group. Prosecutors accuse the company and two executives of violating Japan’s Financial Instruments and Exchange Act by allegedly under-reporting Ghosn’s compensation by about 5 billion yen ($44.4 million) in the 2010-2014 fiscal years, the Nikkei newspaper, broadcaster NKH and Kyodo News reported. Ghosn has been locked in a Tokyo detention center since his Nov. 19 arrest on allegations of financial misconduct at Nissan, the company he rescued from near bankruptcy almost 20 years ago and was leading as chairman until being dismissed late last month. Kelly, an American director on Nissan’s board, was picked up the same day and accused by the company as the “mastermind” behind the scheme. The law firm of Go Kondo, one of Ghosn's lawyers in Japan, declined comment following Ghosn’s reported indictment. A family spokesperson said they also planned no public comment. 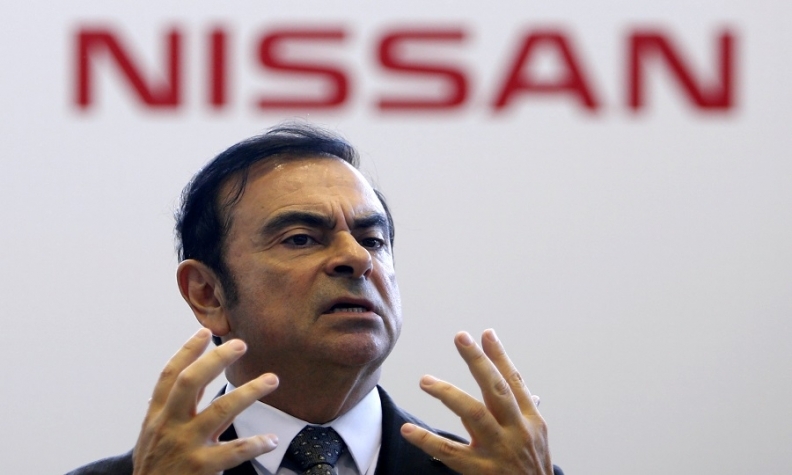 Ghosn has denied any wrongdoing, according to the spokesperson and Japanese media reports. Kelly’s lawyer in Japan, Yoichi Kitamura, confirmed his client’s indictment and re-arrest. “We believe that he is innocent, so we will fight in court,” Kitamura said. If found guilty, Ghosn and Kelly could each face up to 10 years in prison, a fine up to 10 million yen ($88,750) or both, according to the Nikkei. Companies can be fined up to 700 million yen ($6.21 million). Both men had been held without formal charge until their indictment on Monday. Ghosn and Kelly were re-arrested on Monday on grounds that extended their detention without bail, Japanese media reported. The two were re-arrested on new allegations that they also under-reported compensation in the fiscal years 2015-2017. They are accused of hiding some 4 billion (35.5 million) in income over that period, Japanese media say. Japan’s system also allows for re-arrest. The maneuver allows prosecutors to arrest suspects again on different grounds and start the detention clock all over again. The re-arrest could extend their custody another 20 days until Dec. 30, Kyodo said. After that, prosecutors must either indict them or set them free. Or, prosecutors could find new grounds for another re-arrest and start the cycle over again. Japanese prosecutors leverage the re-arrest system to conduct lengthy investigations and gather more evidence, partly in the hope of eliciting a confession. The cycle of detention can last a long time. Muneo Suzuki, a former lawmaker in Japan’s lower house of parliament, was arrested on bribery allegations in 2002. He spent 437 days in detention before eventually being found guilty and sent to prison. Nissan’s internal probe of the matter accuses Ghosn of hiding some 9 billion yen ($79.9 million) in deferred compensation over the combined eight fiscal years in a setup to have him paid later. Nissan has been cooperating with investigators, the company has said. A person familiar with the matter said Nissan had been preparing for the possibility of charges against it since the allegations against Ghosn and Kelly first emerged last month. Prosecutors say deferred compensation needed to be fully reported by Nissan in securities filings, even though the amount hadn’t been paid out yet, because it was a future liability against the company, a person familiar with the matter said. CEO Hiroto Saikawa apparently signed documents relating to plans to pay Ghosn’s deferred compensation after he retires in the form of a consultant fee, the Nikkei said. But Saikawa apparently didn’t understand that the document was designed to set up deferred payments, and prosecutors believe he was not involved in misstating regulatory filings, it said. Prosecutors face hurdles in trying to convict Ghosn, said Masaru Wakasa, a former deputy at the Tokyo prosecutor’s special investigation. They must prove that the amount and timing of future payments are definite, Wakasa said. They must also show that there was an obligation to report the payments in financial statements. That gives Ghosn’s defense team some wiggle room to fend off charges, Wakasa said. Wakasa added that Japan’s methodical prosecutors will likely have already attained a ruling from the country’s Financial Services Agency that such financial reporting is necessary; otherwise they wouldn’t be as confident as they apparently are in pursuing the case. Ghosn and Kelly have reportedly admitted that Ghosn’s remuneration was not entirely stated in reports, but they say doing so was not necessary because the amount had not yet been decided, Kyodo said, citing unnamed sources familiar with the investigation. Prosecutors are likely to re-arrest Ghosn again, even after the current period elapses later this month, Wakasa predicted. “Chances are high that he will stay in detention until at least the end of this year,” he said.